Mexican style by the Gringo Gourmet. 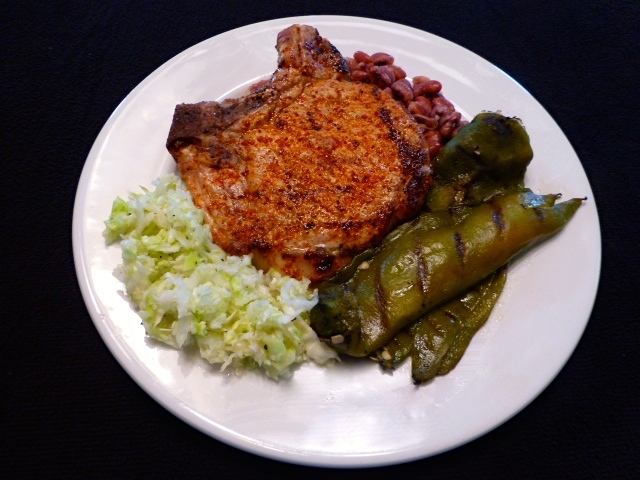 From the top: pork loin chop seasoned with Mexican chile lime rub sitting atop Anasazi beans – an ancient bean that is now available commercially; on the left, Mexican style cole slaw – grated cabbage dressed with white vinegar, salt and pepper; and on the right, roasted and peeled long green chiles stuffed with cheese and laid on grill long enough to melt the cheese and give the chile’s some marks. When I saw chile’s like this in a magazine called chili rellenos, I thought the Yankees were back messing with some good stuff. I was nicely surprised. The chile and cheese were a perfect accompaniment for the pork chop. And, this side is certainly easier and less messy than traditional chiles rellenos! They may happen this way again. Note: I usually buy my chiles freshly roasted from a local grocery. Some times they are so blown apart that they can only be used in chile sauce. Last night, there were four intact chiles, so I did the cheese relleno on the grill thing and it was very good. 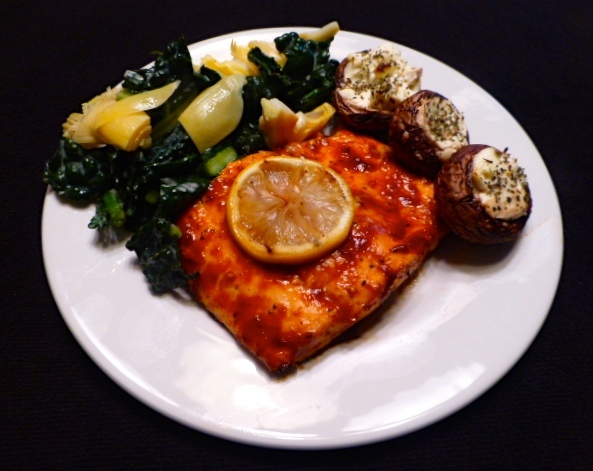 Grilled salmon finished with Julio’s Barbecue Sauce is always a hit at this house. On the side, Tuscan kale macerated with lemon juice and tossed with minced garlic and canned artichoke quarters. I found a bag of chopped Tuscan kale at the store. It still had bits of leaf attached to the central vein. When preparing whole leaf kale, I prefer to cut the vein out because it can be tough. Twenty to 30 minutes with the lemon juice tenderizes the kale but doesn’t make it go limp. The juice and kosher salt also take the edge off the bitterness of the greens. Herbed stuffed mushrooms were a mellow contrast to the sharpness of the salad and gentle heat of the sauced salmon. Chef Steve McHugh has a restaurant in the old Pabst Blue Ribbon Brewery building in San Antonio. The restaurant is named Cured. One of McHugh’s signature dishes is PBR Steamed Mussels with Tasso and Spring Onions. The not so secret ingredient is Pabst Blue Ribbon Beer. McHugh says that when he was 15 or so, he’d steal it from his father. Who didn’t do that as a kid? 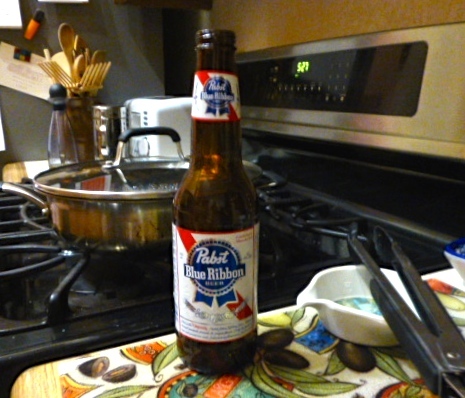 It is difficult not to finish off the half bottle of beer that should help finish off the steamed mussels in the pan. The recipe uses tasso (or good smoked ham if you can’t find tasso) diced and crisped in olive oil. The white part of a spring onion and a minced clove of garlic are sautéed with the ham, then the mussels are added and stirred about until they start to open. 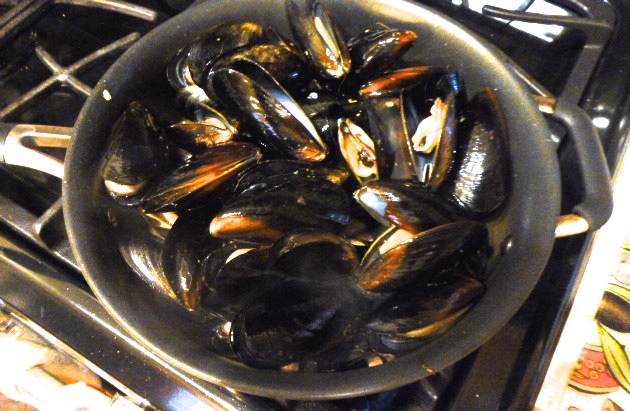 Half a beer is added, the pan is covered and the mussels steam about five minutes more until they open. Time to add the rest of the “goody” and finish the dish. 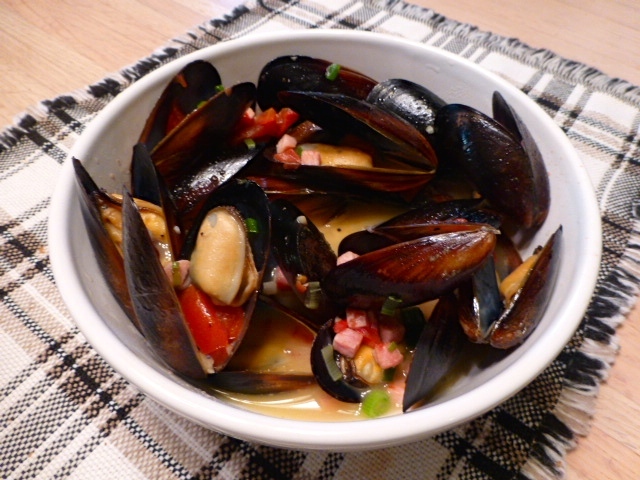 When the mussels have opened, add the rest of the beer, the green part of the onion, diced tomatoes and 1/4 cup of butter. Stir it up while the butter blends in and the tomato and onion heat through. Dish it up, tossing out any mussels that didn’t open, and serve with a baguette or other hard bread for dipping in the fabulous broth. The look, the smell and the taste… all good! PBR Steamed Mussels and a rich broth and lots of “goody” to enjoy make a great meal in about 20 minutes total prep and cooking time. This one’s good for a repeat… unless I finish off the six-pack before I get it made again. It is a challenge to get more southwestern that Anasazi beans. They are an ancient bean used by native peoples in the southwest. They are being grown commercially, now, and I only have to drive 40 miles into New Mexico to get them! As with all dried beans, they must be picked over and any pebbles and broken or shriveled beans removed before washing. I’m fascinated by the red and white marbling of the Anasazi’s skin. 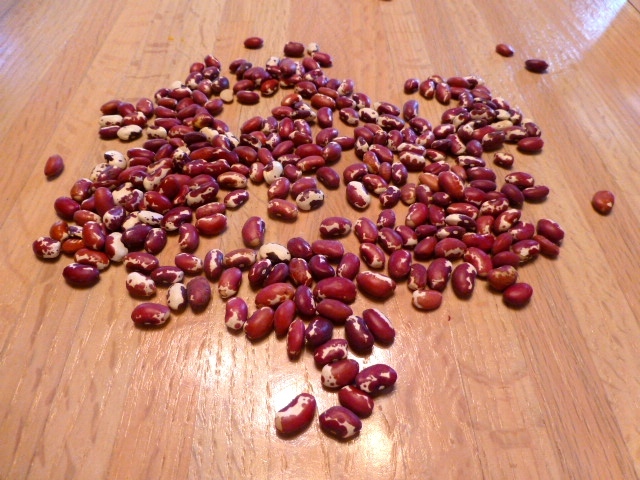 When cooked, they become a solid color just a little lighter than the red of cooked pinto beans. 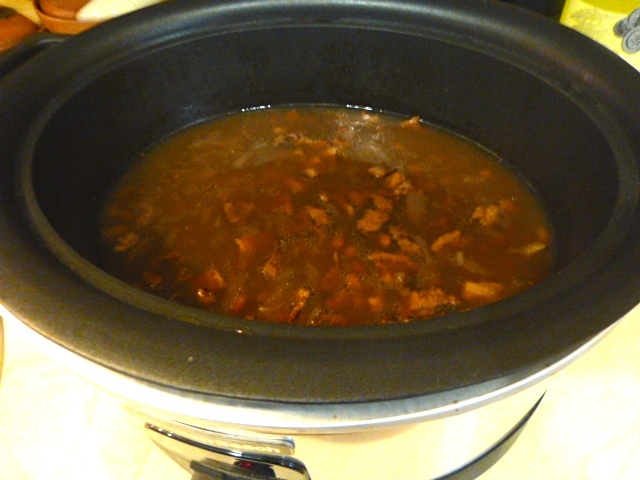 Anasazi beans in the crockpot with lardon (small bacon strips), sliced onion, minced garlic, and water for about 4 hours on high (taste for doneness) and then down to warm until serving time. Sometimes you just crave a rack of ribs. 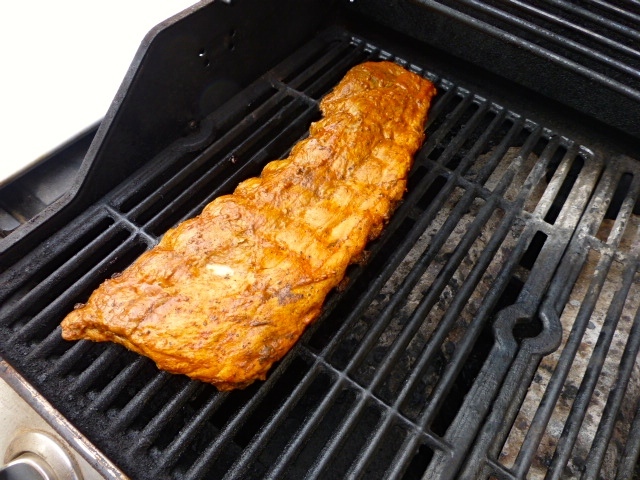 I peel the membrane off the underside of the rack of baby back ribs, place the rack on heavy duty foil and baste it on all sides with Woody’s Cooking Sauce, seal the foil and put it on a rimmed baking sheet in a 250 degree oven for about 3-1/2 hours. This time, I used the hickory flavored Woody’s sauce. It was ok, but I’ll stick with the original next time. The original has a little more kick to it and a deeper color. When the ribs are finished baking (160 on an instant read thermometer in the meaty part), I put them on the grill over indirect heat and give them another baste with the cooking sauce. Ten or 15 minutes on the grill gives them a little more flavor, deeper color and it sets the sauce. Since we’re thinking Southwestern, I had to finish out the native people’s Three Sisters (beans, squash and corn) with a pot of corn, squash, onion, garlic, tomato and some green chile. The Three Sisters provide complete nutrition, but I’m a carnivore do enjoy some animal protein as part of the meal. 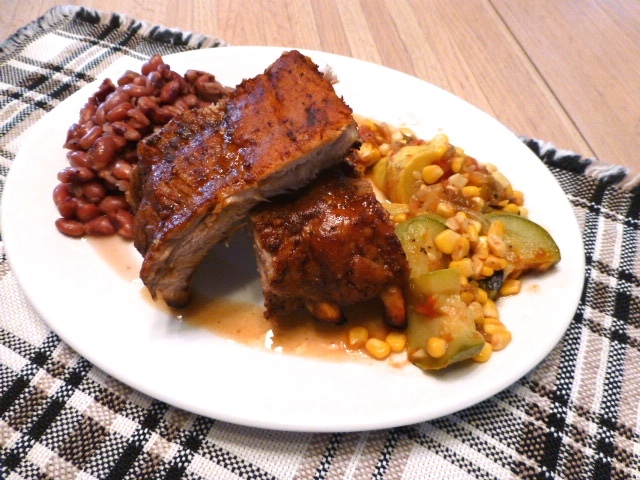 Baby back ribs, Anasazi beans, squash and corn; Southwester cooking’ is hard to beat. I think chicken wings are a great comfort food. I boil my wings in salted water for a bout 20 minutes, then I drain them and toss them around a bit to get the water off. I put them in a large mixing bowl and sprinkle them liberally with Frank’s Red Hot Wing Sauce. After 10 minutes, I sprinkle them again, but with the original Frank’s RedHot Sauce for a little extra kick. After another 10 minutes, I put them on the grill to crisp up a little and get a slight char. I like to add another round of hot sauce after they come off the grill. 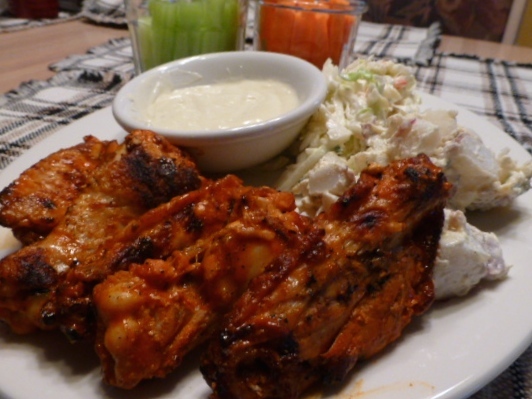 Serve ’em up with a little deli cole slaw and creamy potato salad. Carrot and celery sticks and bleu cheese dressing for dipping and you have comfort foot with a kick! Have plenty of paper towels or napkins handy. Wings can get good and messy. Among my favorite breakfast treats are huevos rancheros (tortillas, green chile sauce and eggs) and enchiladas montadas (red enchiladas with an egg on top). Despite what you read on some menus, enchiladas montadas means the tortillas are stacked, not that the egg is mounted on the tortillas. The best of both worlds is huevos divorciados (divorced eggs). You get the green chile sauce on one side of the plate, and the red chile sauce on the other. You can add refried beans or pot beans and whatever down the middle if you wish. Sometimes you just want a simple uncontested divored egg breakfast. I call it Instant Breakfast and it is super easy and super fast from the fridge to the table. Instant Breakfast fix in’s for huevos divorciados. It is Instant Breakfast because almost everything is ready to use. You just need to chop a little onion, warm the tortillas and sauces and cook the eggs. It is much simpler than making the salsas and tortillas from scratch! I use El Pinto Green Chile Sauce (not the salsa) and either the El Pinto Red Chile Sauce or Red Enchilada Sauce. Both are ready to use straight from the jar. 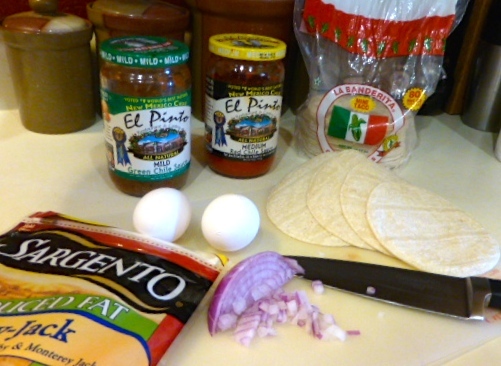 El Pinto products are produced by the twin Thomas brothers of El Pinto Restaurant fame in Albuquerque. Today, I decided to use up some of the min-taco size corn tortillas that were in the fridge. It takes a long time to use up a package of 80 little tortillas! 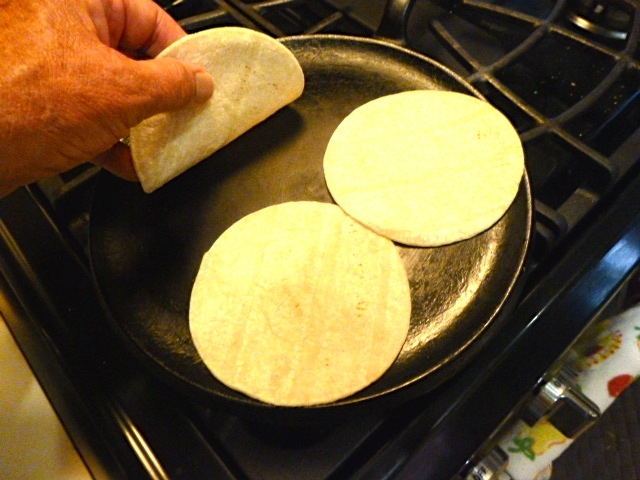 Tortilla flipping on the comal (griddle) requires deft finger work if you want to retain your finger prints. I don’t fry my corn tortillas, primarily because I don’t like to clean up after frying anything. I heat them on my cast iron comal because I’m not comfortable with playing in a gas flame with my bare fingers as some traditional cooks do. Spoon some of the chile sauces onto the tortillas on a plate and sprinkle with a little chopped onion and shredded cheese. I put my plates in the oven to stay warm while I cook the eggs. I do cook the eggs in a pan with a hint of oil, but not enough oil to spatter everywhere. Silky egg yolk and chile are a great way to start your day. 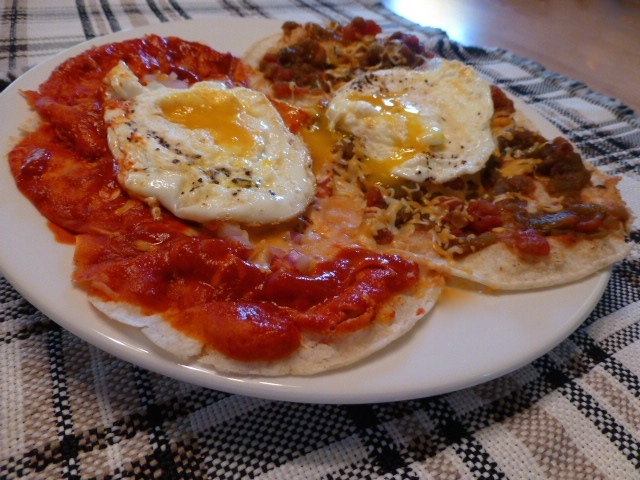 The result – huevos divorciados in the simplest form. You can dress it up with lettuce, beans and maybe a little chopped cilantro, but if you want it as Instant Breakfast, just puncture the yolks of your eggs and dig right in. Top rack: grill roasted corn keeping warm. Bottom rack: Peach salsa baste sets up on pork chops finished over indirect heat. Dining at dusk on the patio. 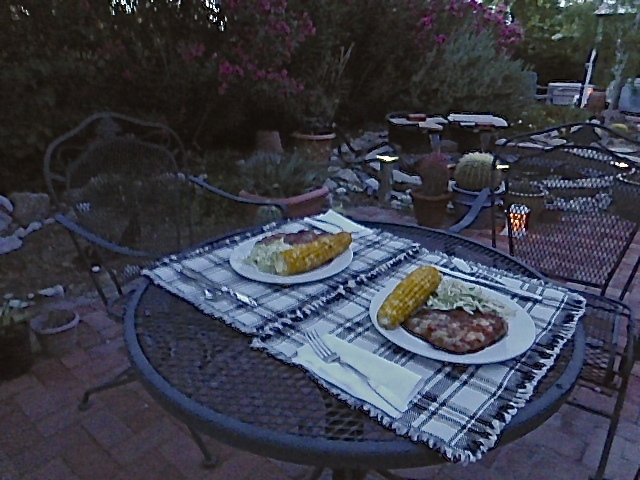 Dinner on the patio in the evening’s fading light. Thick cut pork chop, brined and seared, then finished over indirect heat. At the last minute, a basting with peach salsa made the chops extra special. For sides? I had to have grilled bicolor corn on the cob and coleslaw with my own sweet-tart homemade dressing. Dinner at the doublewide ain’t bad on a summery evening. Okra is true southern comfort food – grilled this time, not fried. 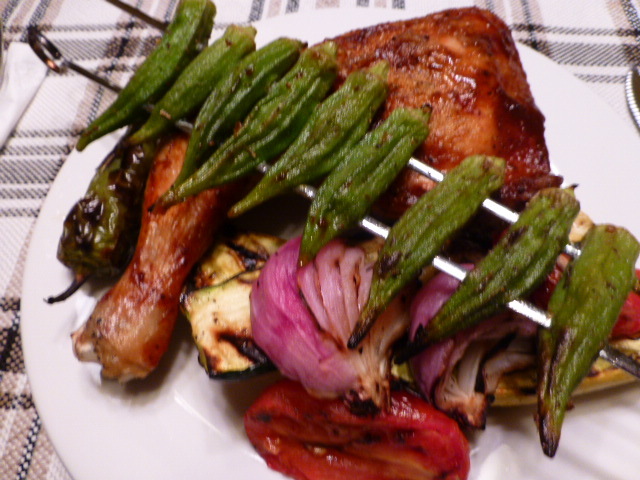 Summer’s finest, grilled veggies and chicken slathered with a great barbecue sauce at the last minute. 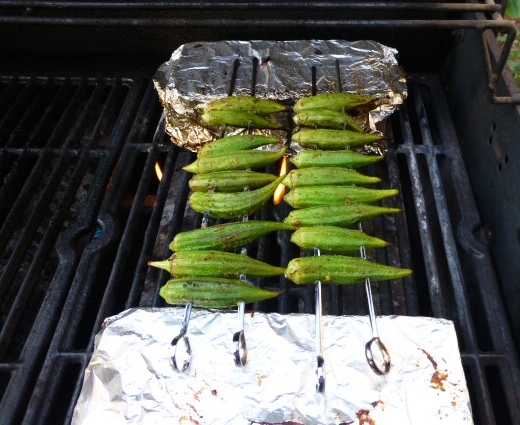 There’s something fun about okra on the grill. This version is tossed in canola oil and sprinkled liberally with Emeril’s Original Essence. I elevate the skewers on foil covered bricks. Cooked at about 350 for three minutes a side and your get tender pods with no mucilaginous secretion. Emeril’s seasoning blend is a subtle compliment to the Okra. I served the okra atop a grilled chicken leg quarter sauced at the last minute with Julio’s wonderful barbecue sauce from the farmer’s market and a pile of grilled vegetables including squash, red onion, roma tomatoes and a jalapeño. Good eats all around. I raved about the sashimi nigiri from Sam’s the other night. It preyed on my mind. This afternoon was springlike in El Paso. 88 degrees, winds of 25 to 35 mph with gusts to 50 and dust in the air. I knew I wouldn’t be at the grill with that going on. Driving by Sam’s on Mesa, it hit me! I hadn’t tried the sushi yet! I picked up a couple of boxes of the California and Nigiri Combo. The combo included six California sushi bites – Krab surimi, avocado and cucumber wrapped in nori (seaweed) and rice and a bright red tempura crunch. I chose the combo because I really enjoy the sashimi nigiri – salmon, shrimp and tuna on rice. The tray included packets of soy sauce, wasabi paste and chopped ginger. Chopsticks were available. I’m from El Paso. I’m very inexperienced with the sushi and sashimi way of life, but I have enjoyed what I have had. I didn’t know what to serve as sides but I really wanted to stay with a seafood theme. I made a gazpacho with Clamato juice, tomatoes, cucumber, celery, onion, chopped krab surimi, a can of chopped clams and their juice and tiny cocktail shrimp. Diced avocado and lemon were garnishes. 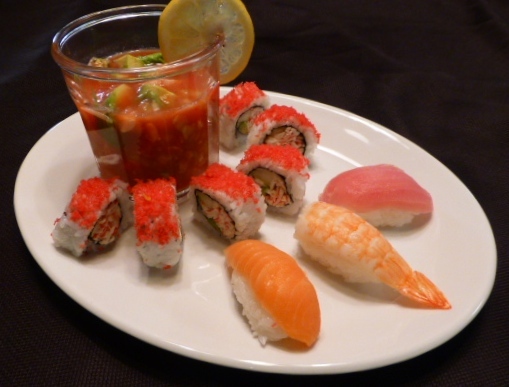 A couple of drops of Frank’s Red Hot Sauce made it just right as a chaser for the sushi and surimi. Brace yourselves, there for four or five more things to try from the Sam’s sushi bar. Big Breakfast at our house used to mean eggs, bacon or sausage, biscuits and gravy. 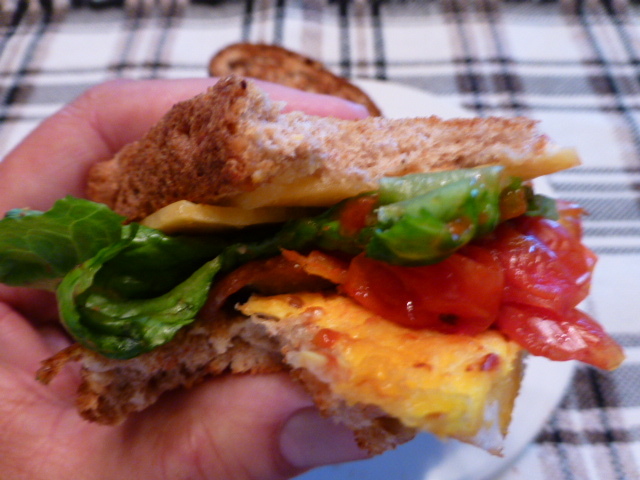 This breakfast sandwich may be a contender in the big breakfast rankings. 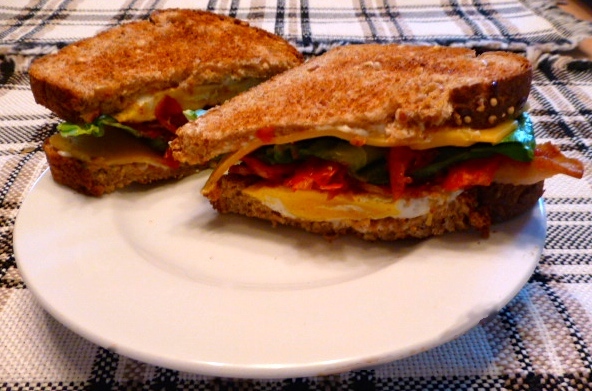 15-grain whole grain bread, toasted, a schmear of mayo to seal the bread, one hard fried egg, two slices crisp thick bacon halved to make four sandwich size slices, medium sharp cheddar, romaine lettuce, and pan roasted tomatoes ramp up the BLT. Make pan roasted tomatoes by halving grape tomatoes, putting them in a dry sauté pan and heating them until they give up their juices and get a little char. When I use them as a sauce, I add a little minced garlic at the end and just a bit of liquid… water or wine. Today, I wanted it spreadable, so I added a little water and used a hand potato masher in the pan to make a thick sauce. The pan roasted tomatoes are a favorite around here. The tastes reminds me a little of sun dried tomatoes. Don’t accuse me of quoting Rachel Ray, but it was DEE-LISH! If only, I’d had the fixin’s for a Bloody Mary. Sigh.